Its 4:41pm on a Wednesday in Houston, TX. Its cloudy. I am sick in bed with a dumb cold. 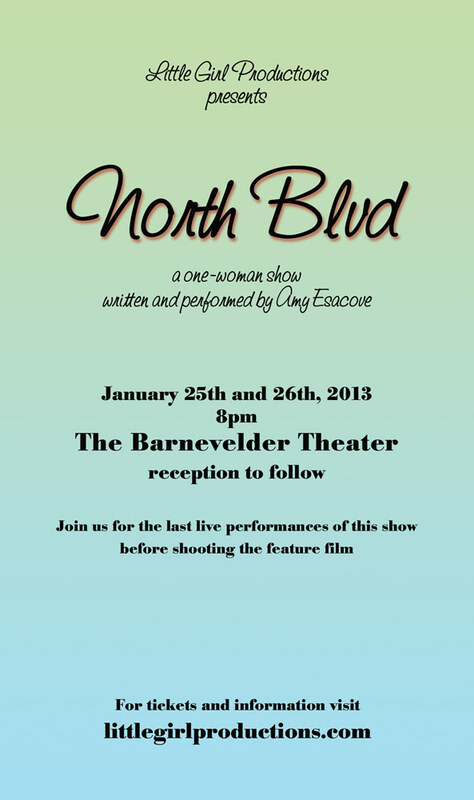 I lay here listening to the hum of the air-conditioner (its December), and I think about the fact that in about a month I will be performing the one woman show version of my story, “North Blvd”, for the last time. I have performed the show countless times over 12 years- yet the closer I know I am getting to performing it, the more terrifying it becomes. Its not the actual performance, and its not the hard work that is involved in the 4 weeks leading up to it- its the 20 minute countdown to actually stepping on the stage. Its hearing the audience chatting out there as they slowly make their way to their seats. Its my stage manager coming back stage and saying, “we’re at 15 minutes”. Its the announcer’s voice telling the audience to silence their cell phones and that there will be no intermission. Its seeing that the lights have dimmed and that I have no choice but to step on stage and vomit to the audience my whole life. Here is my heart. I am surrounded with support. Its all around me. Ticket sales have already started to come in. With more than a month before the performance, that’s a VERY good sign. When the January edition of Paper City Magazine comes out, I will have a beautiful quarter page ad towards the front. With all of this support around me, I feel a little lonely. The house in which I am a guest is just a few blocks away from the title street, North Blvd, where I grew up. My daily walks are layered with tears of gratitude, inspiration, and nostalgia. There is a touch of sadness about it all. At 40 years old, I do believe I have gotten over the anger of it all- the chaos in which I grew up. I have found my way and brought myself up right. Its a little sad that I am truly saying goodbye to it once and for all. Once the film is made, and the story is out there, its no longer mine. Its yours. It will be yours to swim in. To cry with. To talk about. To relate to, or not. But it will no longer be mine. Once I step on stage, everything will be fine. My split brain will become one and I will be in the flow. And if you can make it to the show, you will receive it and listen and laugh and maybe cry…just know that before the show begins I am back stage. Freaking out.